Gourmet foods and gift sets for true Foodies. All products produced in Tampa Bay. Each gift set includes a customizable combination of gourmet foods and a free gift box. All items shipped in USPS flat rate, priority mail boxes. Use "Add to Cart" Paypal buttons below to purchase products. Shipping costs vary by order size. Please call us for larger orders (727) 644-7500. 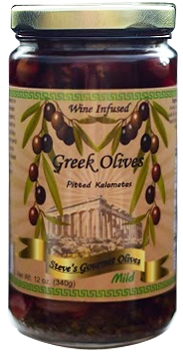 Kalamata olives marinated in a bold red zinfandel wine and a savory blend of herbs, spices, garlic and mild peppers. Perfect addition to Greek salads, orzo pasta dishes and virtually all of your Mediterranean recipes. Kalamata olives marinated in a bold red zinfandel wine and a fiery blend of herbs, spices, garlic and habanero peppers. 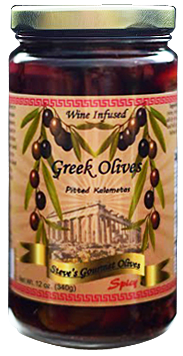 Perfect addition to Greek salads, orzo pasta dishes and any Mediterranean recipe where you want to add a little heat and flavor. 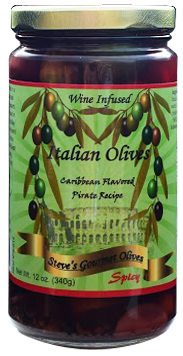 Our Italian olive medley marinated in a bold red zinfandel wine and a savory blend of Caribbean herbs, spices, garlic & peppers. Complex flavors that unfold in your mouth in layers. Great for antipasto, party trays and anything with a red sauce. Pairs well with sharp cheeses, grilled steaks and bold red wines. 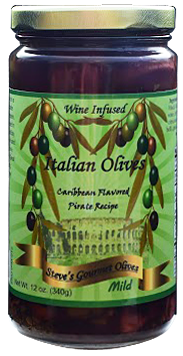 Our Italian olive medley marinated in a bold red zinfandel wine and a fiery blend of Caribbean herbs, spices, garlic and fiery habanero peppers. Complex flavors that unfold in your mouth in layers. The perfect marriage of flavor and spice. Great addition to antipasto, party trays, mexican food, barbeque or anything with a red sauce. Pairs well with sharp cheeses, grilled steaks, and bold red wines. Fully loaded Bloody Mary mix with savory, smoky edge. Roma tomato base with Worcestershire sauce, horseradish, celery seed and bacon infusion. Just add vodka and olives. Great gumbo starter too. Fully loaded Bloody Mary mix for the fire-breather! Roma tomato base with Worcestershire sauce, celery seed, horseradish, black pepper, cayenne peppers and chipotle peppers. Just add vodka and olives for a party in a glass. Makes a great Michelada too.